As we moved to this mid-range article we were pleased to see that our existing five selections stood up to scrutiny even in late 2018. While we left our chart as it is, we added the Philips Fidelio X2/27 for yet another quality option in this price range. If you feel you need a pair of mid-range studio headphones, this usually means that you are ready for something with more precision. Thankfully, just like any piece of audio equipment, studio headphones offer a much better performance as their price increases. What To Expect From $300 Studio Headphones? Even though headphones that cost $200 have their benefits for studio monitoring and mixing, the mid-range sets we are going to look at today will offer critical listeners near flawless sound. We have selected six very popular studio headphones that cost less than $300 – all of which have proven their worth multiple times. Stick around after the chart for a look at what makes these headphones so special. The absolute best combination of high performance and comfort at the moment. An awesome hybrid set that combines the best features of both worlds. Robust, well engineered and well dialed in open back choice for professionals. The flagship model of a truly iconic series that delivers impressive results. A stylish open-backed pair of cans with a soulful sound. An unassuming model that is all about performance, true comfort and consistency. Sennheiser is no stranger to high end studio gear. After all, some of the best headphones in the business are made by none other than them. Sennheiser HD 600 brings a lot of that excellence in a package that is a bargain at the moment. What we have here are open backed studio headphones with a set of very carefully voiced drivers and a chassis designed to optimize comfort even during very long sessions. No matter which aspect of these headphones you look at, it becomes apparent that Sennheiser went above and beyond to make it near perfect. When paired with a decent amplifier, Sennheiser HD 600 deliver one of the best studio headphone experiences you can find right now. 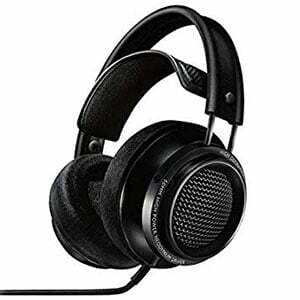 Beyerdynamic DT880 PRO are a semi open set of studio headphones that might come across as strange at first. The overall design doesn't look like it is durable nor strong, however it is. The headband is similar. It looks like they just applied some padding to a most basic type of headband, but it turns out to be one of the more comfortable designs out there. In terms of performance, things are far less uncertain. DT880 PRO, with a decent amp, will give you an incredibly flat frequency response across the range. It is only when you reach high trebles that they start to deviate from that flat line. If precision is your thing, DT880 are the headphones for you. 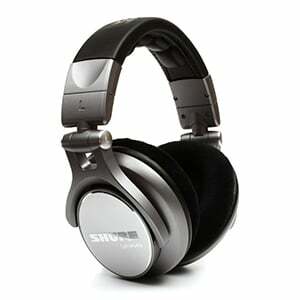 Shure's open backed studio headphones offer a very impressive experience at a more than reasonable price. Their SRH1440 is a perfect example of this. With an imposing frame design and impressive selection of drivers, these headphones deliver a wide sound stage that doesn't lack definition no matter where you look. In terms of transparency, some compromise was necessary in order to facilitate for the open design, however there's plenty to work with. One of the main features Shure SRH1440 offers is the low impedance. You can easily drive these with your mobile device and experience no performance penalty. Lastly, we have the surprisingly low fatigue factor made possible thanks to Shure's selection of padding on the headband and ear pads. If there is one family of headphones that is loved all over the world, it is Audio-Technioca's ATH M series. To put it in simple terms, if your budget is limited and you want the best bang for your buck, this is the brand and series you go to. 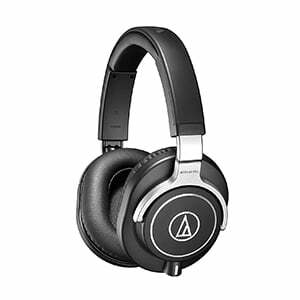 At the very top of this family we find Audio-Technica ATH M70x, the flagship model. It is all we hoped it would be, and then some. With durable frame, proper build quality and very balanced performance, ATH M70x ticks all the right boxes necessary for professional studio use. Sure, it doesn't come packed with bells and whistles, but it meets the core requirements and that is more than enough for us. Whether or not Philips was listening to user feedback about the popular X1s, the new Fidelio X2/27s have several new features that make them a worthy addition to this chart. It’s a very stylish, ergonomic and comfortable open-backed pair, with a strong aluminum build, self-adjusting mesh hammock headband, and deluxe velour-covered memory foam earpads. With powerful 50mm neodymium drivers and layered motion control diaphragms, the X2s offer a very clear and open soundstage – one which has a bit of life to it. Be sure to check out the complete Philips Fidelio X2/27 review for all the details. 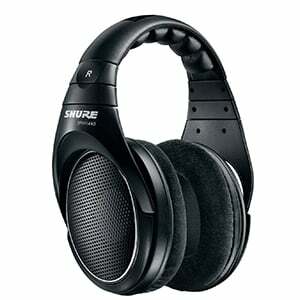 Shure has designed a series of impressive studio headphones that sport some promising specs. One such model is Shure SRH940. Despite their rather bland aesthetics, these headphones offer impressive performance in areas which matter the most. By that, we mean great transparency from lows all the way to trebles, and a comfortable design that prevents user fatigue. The set of drivers chosen by Shure for this build is perfect. Their dynamic range, fast response and power handling makes SRH940 a great choice for both studio use and applications on the go. Add to that a set of really comfy velour ear pads, and you have a pretty competitive platform that can give some market favorites a run for their money. Despite how good these headphones are, beginners are often reluctant to spend this kind of money on a piece of studio gear. We can’t really fault them for that seeing how headphones performance can be rather confusing at times. Starting with a something cheaper, such as good $100 set of studio headphones is much more sensible. With that said, there comes a time when you feel the lack of performance that begins to hold you back. When that happens, most producers aren’t that reluctant to invest it higher end gear anymore. The main question here is what does $300 get you? Performance is a big one, but so is comfort. These two things are imperative for serious studio work. What we are going to do now is take a look at each of the fields of improvement individually. That way you can get a proper picture of where your money goes with these headphones. What defines performance in studio headphones? For the most part, it is their ability to deliver transparent, flat response across the range. In order to achieve this, any given pair of studio headphones has to be backed up by proper hardware. What you will find in this particular price range is that most models feature carefully chosen and voiced drivers. With that said, you will run into two types of headphones here. Some are going to be closed back, while others are open back designs. Sometimes you can even run into hybrids as well. The main difference between these two types is that the former offer sound isolation from exterior noise pollution while the latter bring that spatial definition and broad sound stage. Depending on what kind of music you are working on, choosing between these two types of headphones can make all the difference. 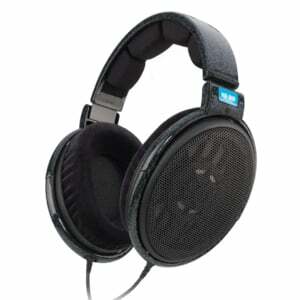 When it comes to impedance, headphones found in this price range often come with high impedance ratings. In other words, this means that you will have to use a standalone amplifier in order to utilize the full potential of your headphones. On the other hand, there are some low impedance models designed for use on the go. Either way, the manufacturers have made sure that the performance is up to the task. The importance of comfort doesn’t really come into perspective until you have to sit down and spend several hours with the headphones on. This is partially why designing and integrating proper padding is almost an art form.The headphones in this price range have that covered in 99% of the cases. One of the most noticeable improvements over the cheaper models is the inclusion of velour ear pads. Even though it doesn’t sound like much, having a set of decent velour pads can completely change the way we experience headphones. Vinyl and other leather-like synthetics are cheap, look cool but feel like hell after an hour or so of use. With velour, you have this soft, gentle material around your ears that prevent chafing, sweating and generally lasts much longer. Headband padding is very important as well. Depending on how it is done, it can make even a heavy set of studio headphones feel like nothing. When you are paying this kind of money, it is only reasonable to expect that all of these features are included. The models we have chosen meet all comfort requirements to say the least. Here’s another aspect of headphone design that is often overlooked. If you were to take a brief survey of the market, from the cheapest to high end models, you would probably assume that most of the headphones look sturdy enough for frequent everyday use. Unfortunately, that isn’t always the case. Studio headphones found in the $300 price range are among those where brands really put in an effort to make them rugged enough. You could even say that some of them are over engineered. Having a proper, often metal frame is imperative. Just ask yourself how many times you are going to put the headphones on, take them off or just push one cup to the side. All of these actions put a decent amount of stress on the body of your headphones.The models you see above are more or less bulletproof in that regard. Especially the ones closer to the top of our list. Aside from the core stability and ruggedness, we also have to address the materials used on the exterior. Sure, in most cases it is going be a plastic of some type. The difference is that these composite materials are not your ordinary brittle plastic. Instead, you are most likely going to run into durable ABS depending on the brand you are looking at. These are more than capable of dealing with usual wear and tear. Spending up to $300 on a set of studio headphones really does buy you a ticket into a whole new world of studio monitoring. Not only is the level of performance raised, but you are presented with options and choices that are just not offered in lower segments of the market. The models we have selected are, in our opinion, the very best you can find on the market at the moment. Not only does their performance and comfort appeal to us, but thanks to their proven track record they are used in professional studios around the world. Settling with one of these pairs is bound to leave you satisfied!